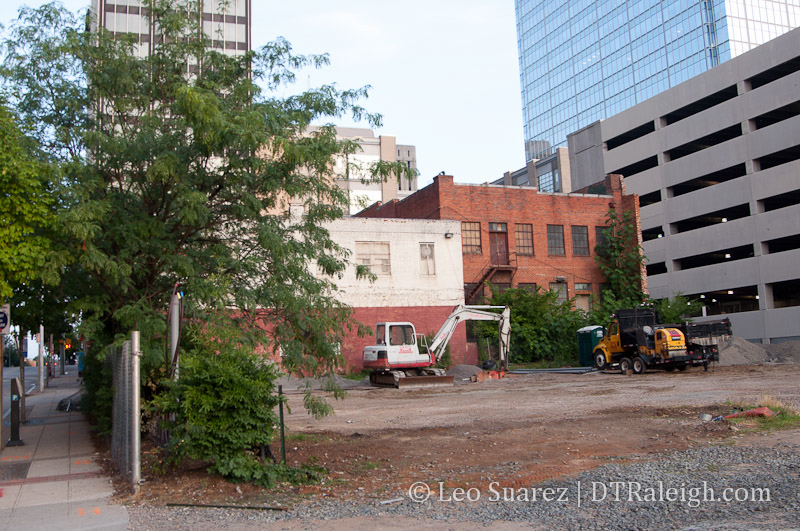 This is part 6 of a 10 post series, rolled out all week, on residential projects in downtown Raleigh. Go here to see all the posts so far. Both the Triangle Business Journal and The News & Observer have reported that this week, The Edison Apartments will begin construction. A part of the The Edison project overall, The Edison Apartments are a complimentary project to Skyhouse Raleigh which sits on the same block. With 239 units and over 18,000 square feet of ground-floor retail space, this project will dramatically change the look and feel of East Davie Street. Before the apartments can be built, demolition must take place. Some of the older brick buildings along Davie and Wilmington Street, dating to the early part of the 20th century need to come down to make way for the newer construction. I’m happy for more residents and retail, but this building just doesn’t belong here. This is a huge lost opportunity. I won’t be able to take anything Sandreuter proposes seriously after this. I’ll just brace myself for another bait and switch. It doesn’t look like they’re about to knock those buildings down yet. I wish they would announce the day, I’d set up a lawn chair in front. LOL! I’m usually fairly positive on development, but this is definitely the first time I feel like the ball was dropped by letting this get built here. It just doesn’t “fit” the location. The loss of Powerhouse Plaza to a 6 story wood apt. building is a bigger loss than anything. Edison will replace some old (no historic) buildings for retail/apts. Just wait till the end of 2015. If homeless feeding was moved out of moore square that area would improve. The area is a garbage dump and not safe..gotta go if you want vibrant growth with foot traffic. Gramercy is on way glen wood south.Grocery store? Unfortunately, the city leaders have approved this crap and while I can remain optimistic that it won’t happen, I am scared to admit that the day will come when this 7-story garbage will fill out the entire Davie Street side of the block. I still can’t believe that the developers didn’t opt for a vertical design. A 10-15 story residential building on the SE corner of the block would have allowed Gregg to utilize the rest of the land for something much taller in the future. BC: I, too, don’t like the loss of the 11-story Powerhouse Plaza, but I am hopeful that the shift from hotel/offices to residential will bring something more to Glenwood South. Like you said, a grocery store may become a necessity in that area, although The Fresh Market and Harris Teeter aren’t far from there. As a side note, I also hate that we lost the 630 North Street project, but Gramercy will definitely have a positive effect, IMO. Miami Beach has a stand alone Fresh Market with parking on top. It sits on a corner in a former industrial/services neighborhood that’s quickly gentrifying to shops and neighborhood services for the adjacent residential neighborhoods. This FreshMarket model is one that I hope will make its way to the Glenwood South area. The store in CV is small and cramped and needs an expansion and this is a perfect opportunity to make that happen by moving it several blocks east. I suspect that nothing will happen in that regard until the Capital bridge over Peace is settled and (possibly) constructed. Most developers are ALL about trying to push through 5-6 story wood construction apartment buildings these days. Anything over 6 (with concrete podium) requires steel beam construction and many developers don’t have the balls or skilled labor to work with that material. This belongs on the periphery of glenwood south and not in a prime spot like this. I realize it’s slightly off topic to discuss the office building planned for the NW corner of the Edison development but here it goes … I was poking around on Wake County’s iMaps website today and noticed that the small 0.07 acre parcel where Reliable Loans sits (along Wilmington St) is NOT owned by Edison Land LLC but instead a private individual. I wonder what’s up with this? Perhaps a deal is in the works to purchase but has not yet been finalized? Otherwise it will be a bit difficult to build an office building when someone else owns a small piece of the land.